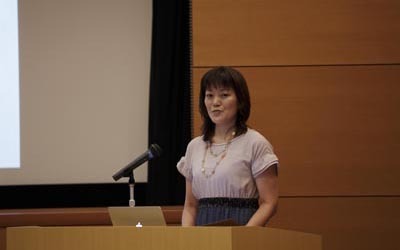 Announcement of the Public Screening held at National Museum of Art Osaka in August 31, 2013 (Saturday). Thank you all for attending the public screening. It is our honor to be surrounded by full of audience. Let us show the sequence of the public screening. 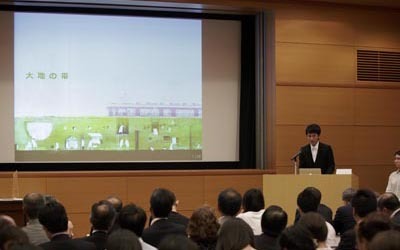 Presentation by the 2nd prize winner, Mr. Keisuke Morikawa. 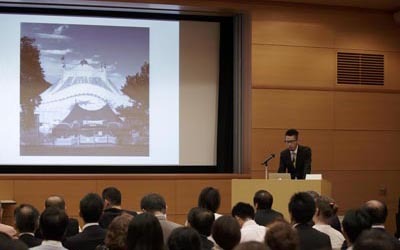 Presentation by the 2nd prize winner, Mr. Shinnosuke Shimizu. 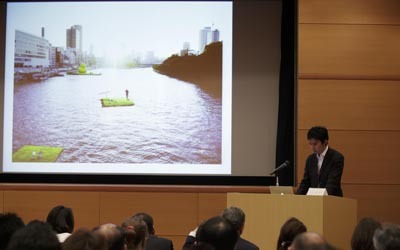 Presentation by the 1st prize winner, Mr. Takahiro Endo. Presentation by the Special winner, Mr. Yim Tak On. 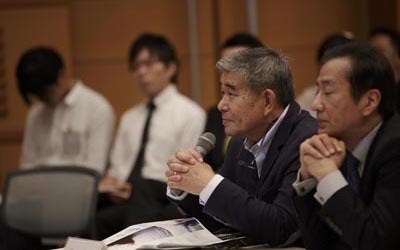 Mr. Shiro Wakui, Landscape Architect, as a Jury member. 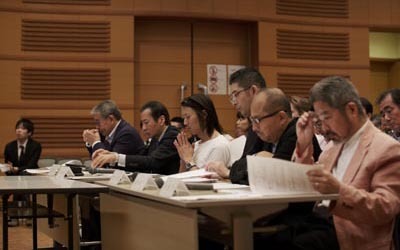 Mr. Shunsaku Morita, Daiwa Lease President & CEO, as a Jury member. 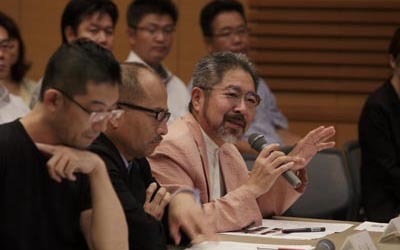 Mr. Issay Kitagawa, Art Director, as a Jury member. 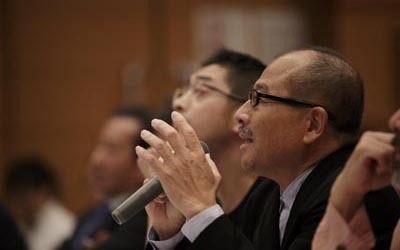 Mr. Junichi Inada, Landscape Architect, as a Jury member. 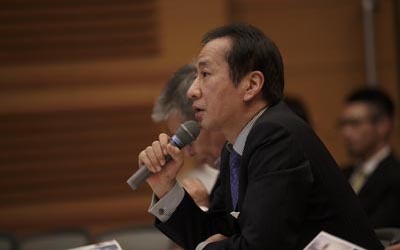 Mr. Manabu Akaike, Universal Design President & CEO, as a Jury member. 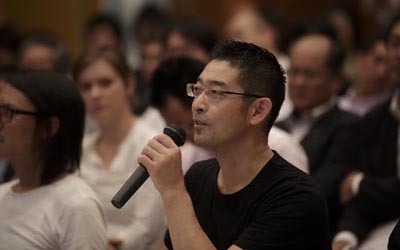 Mr. Kohki Hiranuma, Architect, as a Jury member. closing remarks by Pres. 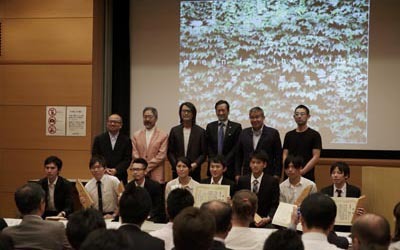 Morita (Daiwa Lease) lastly, the winners together with the juries.
" green for the future "
Since the coexistence of nature in the city became in demand, several techniques have been groped. However, the current city is surrounded by the buildings, which make difference to the ideal state. In addition to cost, maintenance, technical problems, environment and the people, it is necessary to think on approaching Green for the future. In recent years, green wall might be one of the methods in effective environmental redevelopment. The consumption of energy is anticipated for minimizing the amount of heat by covering the walls with green. This can be a new system attached to the construction, or it may give alternative usage in open spaces and the industrial parks. In many years of enduring the constant approach, not only exploring but also it may offer huge opportunities to the small parts, which seldom attracts attention until now. It will lead to new discovery to pursue possibility in every point of the city of the building. We are in need of solution for the problems and new approach in order to improve the city. Green in the city still has many problems in its efficiency, yet extends on having several visions by facing each problems while considering the other facts. At first, we create city that surrounded by Green, where we can live together with nature, and it comes with the future comfort. For example, a view you see from the train on each day, such usual view may change a lot through this competition. We request to the young generation who bears the future, to consider the coexistence of nature. Making this opportunity to think on Green for the city may give us a solution for improvement. With the free way of thinking, we urge for ideas to new city image while appreciating the coexistence of nature. open to college or university Graduate, Apprentice, Architects, Engineers and Designers anywhere in the world. must be under the age of 30 on August 30, 2013. group participation is allowed as long as each member meets the qualifications of the above. a design proposal for an existing area with the list of informations to comprehend the features. a design that offers potential for the future.  * set the site location within Osaka city (if possible). for registration, send by the web-form link below. registration number will be sent via e-mail. * complete the resgistration before the dealine to avoid web congestions. * registration after dealine will be considered invalid. submit to: attach the proposal to the reply of registration e-mail. text must be written in either japanese or english. * entry would be invalid if any information is indicated other than the applicant’s number. proposals of the 6 groups who passed the first stage will be evaluated accordingly. 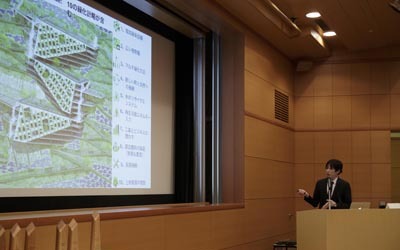 presentation of each proposal will be held on the second stage. * the registration will close automatically upon reaching 130 attendants. * seats assigned prior to application. in case of non-participation, please inform via e-mail atleast a week before the event. 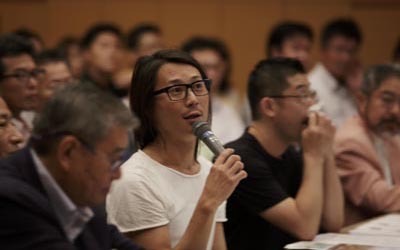 the entry is limited to the design proposal that is unpublished inside and outside the country. using same design proposal in two different competitions is considered invalid. there will be no returning on design proposals upon submitting the entry. make copies on your own, beforehand.the copyright of the winning prize belongs to the applicant, however the applicant cannot use the rights on peronal practice. in addition to, a sponsor monopolizes the negotiating rights for the enforcement of the copyright and decisions. 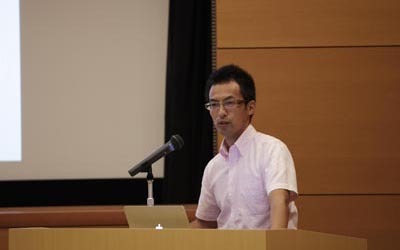 It is responsibility of the applicant on infringement of copyright. In such a case, winning prize is void by the judgment of the host. 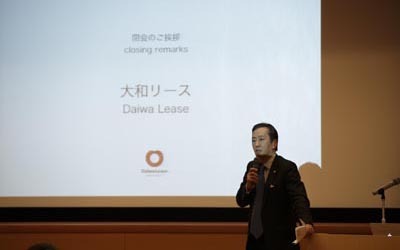 [ collaboration ] Diawa Lease Co., Ltd.
http://green.aaf.ac/ Copyright 2010-2013 Art & Architect Festa. © AAF All rights reserved.